Larsens is a very long cry from the roughing it under canvas so many of you are probably familiar with. 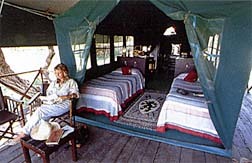 Discreetly sited on the banks of the Uaso Nyiro River in Samburu National Reserve, spacious airy tents, all raised on wooden platforms, nestle between acacia trees and doum palms. Tranquility and nature embrace you the minute you enter Larsens. The river is the perfect stage for an endless pageant of wildlife - elephant rolling and trumpeting in the shallows, timid impala nervously drinking, baboons and vervet monkeys swinging through the canopy of trees and the birdlife! One wonders why you bother to go on a game drive at at all. Larsen's staff are all handpicked to ensure that camp service is second to none. Although a delicious breakfast and barbecue are cooked in front of you, behind the scenes our chefs are hard at work preparing the mouth-watering dishes for which Larsens in renowned. If one of your lifelong ambitions is to experience the Africa known to the country's intrepid pioneers, far from the beaten track and in the special solitude that allows a unique kinship with nature, then at Larsens your dream will come true. 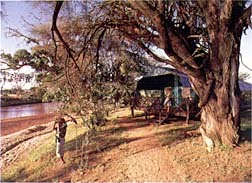 In order to retain the tranquil atmosphere, children under 7 years are not allowed in camp.